The battery life of our smartphones and connected objects declines over time. 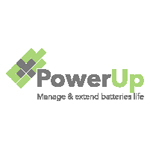 To overcome the problem, the start-up PowerUp developed MoonPlug, the first connected object capable of preserving the battery life of smartphone and tablet batteries using a charging optimisation algorithm. It helps increase battery life by up to two hours! The start-up also offers a system to monitor the battery performance of drones and other connected objects. This solution comes with a software management interface that allows users to monitor the battery life of multiple object fleets in real time, irrespective of whether they operate over a low-bandwidth network or Bluetooth. PowerUp took part in season 6 of Orange Fab France.